Good afternoon scrapping world :) I hope you are having a great day. I am, I got happy mail! Yes, my PTI order is here!!!! I can't wait to play (I sound like a kid, don't I?). 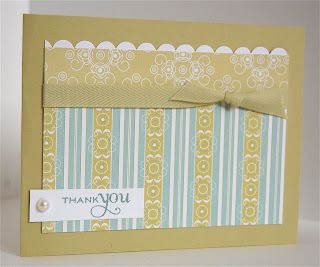 Ok, on to my card...I made this card some time ago, when stocking up on thank you cards for the holidays! I love this PTI paper, it makes me feel so peaceful!! It's a super easy card to make and a great way to use up those scraps. There is little stamping, just a few quick cuts and wa-la, you are done. The next time you aren't feeling so crafty, or you seem to have lost your mojo, grab some scraps and make a simple card like this one. Sometimes, the most stunning cards are the most simple. They tend to pack a lot of punch!